So we have a “repeat” of the Players Championship Final … the same two guys, only it’s over 25 frames and three sessions this time. The second semi final didn’t provide the same intensity and tension as the first. 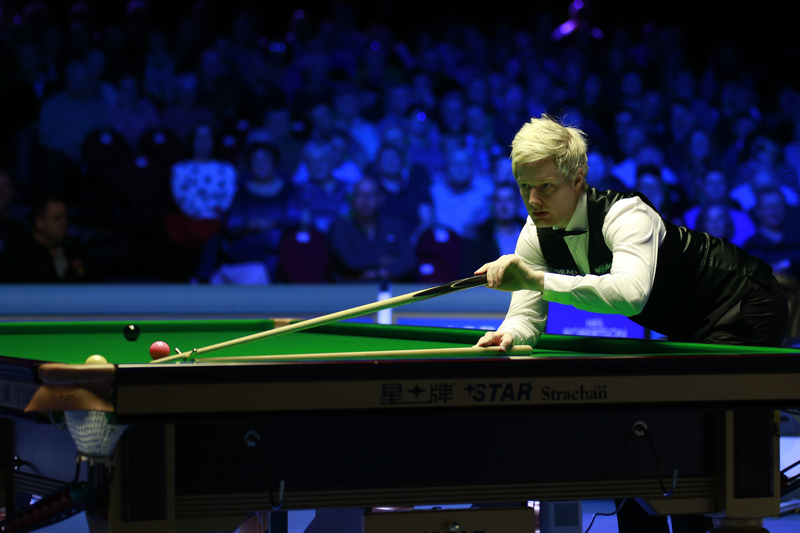 Neil Robertson played very well towards the end, and – it has to be said – he also had luck on his side. Or rather Mark Allen had a lot of bad run of the balls. It was obvious that he grew very frustrated as the match unfolded. Nothing worked for him. 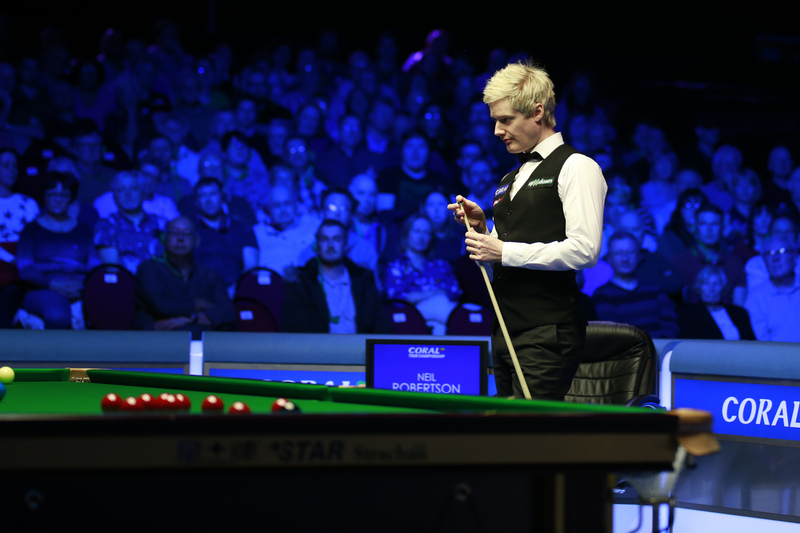 It all exploded in the last frame where, after Neil Robertson had given him an unexpected chance, and it looked for all the world that he was going to make it 9-7, Mark Allen snookered himself on the last red. Anger got the better of him and he sent the white around the table at meteoritic speed … it was his last shot. The win sees Australia’s Robertson reach his third straight ranking final and the 25th of his career. He will take on Ronnie O’Sullivan for the £150,000 top prize. The best of 25-frame clash will take place over three sessions on Saturday and Sunday. The winner will be guaranteed to take home the Coral Cup, which is awarded to the player who earns the most money across the three Coral Series events. Whoever wins on Sunday night will also take the Coral Cup and this trophy. Before the match they showed a short interview with Ronnie following his win on the previous night. Honestly it’s hard to call a winner here. Ronnie had a day off, and should be more rested, but I’m not sure that he will be able to muster the same intensity against Neil – who is a good mate – than against Judd. Not that Judd is an “enemy”, but their rivalry at the table is intense and Ronnie was on the back of two final defeats. Also it would be better if he could take the facts that a win would bring him on par with Stephen Hendry regarding ranking titles, and get him back on n°1 in the rankings, out of his mind. But I doubt that the media will allow him to forget that. That said Ronnie looked determined all week. He could do with finding back his long potting though… Neil on the other hand will want to take revenge on the 10-4 drubbing he was inflicted in Preston. If he plays the way he did at the end of the match yesterday, he will be hard to beat. However, yesterday, my feeling was that he was playing with freedom: he sensed how frustrated Mark Allen was, he knew he “had him”. Against Ronnie, he will know that he can’t let his guard down at any time. I totally share this feeling of potentially lower intensity. I’m sure, come the match tonight and tomorrow, I’ll get all excited and will root for Ronnie and even now I hope he’ll win, but I don’t have the same anxiety as I had before the semis. It’s never good to lose a final and would be nice to be Nr 1 (although for me the ranking is also a very pragmatic question and will matter to see what draw Ronnie gets going to the Crucible as Nr 1, or Nr 2), but even if Ronnie loses, it can’t be as bad as losing to Trump for the third time would have been (or as the loss at the Masters was). But of course, having said that, good luck!